Funny where a conversation over a couple of pints can lead. On a night in late Autumn 2010, two writers met in Neary’s – a favourite watering-hole in Dublin – for a couple of pints and a chat. So far, so normal – this is Dublin after all where pubs and writers go hand in glove. We’re old friends, having met at a literary festival in the south-west of Ireland over a decade before. Our conversation that evening took a turn and we found ourselves discussing the merits of collaborative writing – something neither of us had much experience of, although we both came from writing backgrounds (Karen Gillece is an award-winning novelist; Paul Perry is an award-winning poet). By the end of the night, we came away with an agreement to try our hand at co-writing a novel. At the time, we were both working on other projects, but we thought it would be fun to try this as a writing experiment, having no expectations and no idea where it would lead. That night in Neary’s, embarking on this writing experiment, we weren’t sure what kind of novel we were going to write, or even what genre we would chose. It became clear early on that we were drawn to the dark side, wanting to write a story that had a mystery at its heart, a story that involved ‘normal’ people whose lives took an extraordinary turn due to unforeseen events. That premise remains at the centre of all our books. The ideas stem from our own deepest fears. We both have small children, and as every parent knows, you dread anything bad happening to your child. This fear was the starting point for The Boy That Never Was – a novel about a couple whose son disappears amid the ruins of a devastating earthquake in Tangiers. Five years later, Harry (the boy’s father) believes he sees the dead boy in a crowd, and embarks on a quest to find his lost son; all the while his wife believes that Harry is suffering a breakdown. If the starting-point for our first novel was imagining something terrible happening to your child, the question that inspired our second novel Only We Know was: What if your child did something really terrible? From there, we imagined what it must be like to have committed a serious crime while you were still a child. How do you carry the knowledge and guilt around with you in your adult life, particularly if the terrible thing you have done remains a secret? We came up with the idea of three people bound to each other by the terrible act they had committed as children while on holidays with their parents in the Masai Mara. Karen had spent some time travelling in Kenya (on the back of a motorbike) and drew on this experience for the Kenyan scenes. Nick, Katie and Luke are bound to each other by what they did that day, and yet, as adults, they all live disparate lives far apart from one another. They cope with their guilt and grief in differing ways – Katie is a hard-living journalist in Dublin; Nick, a musician, buries his feelings deep inside and is the only one of the three to return to Africa; Luke channels his energy into business, building a successful empire with a public profile. But when Luke goes missing under mysterious circumstances, and Katie receives anonymous threats, they begin to understand that the secret they thought was buried has been unearthed. Someone else knows what they did that summer and is intent on seeking justice. When it comes to the collaborative writing process, we start by taking responsibility for a character each. (With Only We Know, Karen took Katie, and Paul took Nick). We discuss a vague outline for the plot – the bare bones – and then we each go away and start writing our individual chapters from our character’s perspectives, putting the meat on the bones. We do a sort of relay-write – swapping chapters as they are completed, the plot building as we go along. The process involves a lot of discussion, negotiation and exploration of ideas. We meet on a weekly basis, and are in touch by phone, email, and text. The exciting part of collaborative writing happens during this first-draft stage, where the plot has not been pinned down and there is leeway to deviate from what was initially agreed upon. We are not just writers but readers too, and there’s something thrilling about reading work so fresh off the page, seeing where the other person is taking the story, watching how it evolves. Inevitably, there are disagreements along the way but we both work hard to leave our egos at the door and focus on what is best for the story, even if that means sacrificing a killer scene that you’ve spent ages crafting but now is consigned to the cutting-room floor. A crucial factor in collaborative writing is trust. You have to be able to trust the other person’s judgment. You also need to trust them when the time comes to put your work in their hands and allow them to re-write it. This happens in the later stages – after a second or third draft – we swap over and re-write each other’s chapters. It’s an important part of the process as it achieves more uniformity of style which might otherwise prove disjointed. It’s intriguing to think how many other older texts with mysteries at the centre of their narratives have also been compiled by more than one author. We think each one of our novels addresses and subverts the sole authority of a text, and like all good stories, we don’t know where the collaboration will lead. 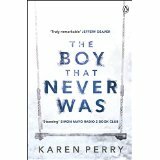 The books Karen Perry writes are not the books Karen or Paul might have written individually. Will we write a third novel together, even a fourth? The answer is yes and we’re already looking forward to those books, tending them as they grow, but unlike the current novel, nobody really knows what’s in store for the characters that will emerge from the imagination of Karen Perry.